Café, fare thee well to Cat, (until you come back). This past week was in great part about coffee. One of the world’s most coveted resources, still picked by hand world round, fuels economies of developing nations and satisfies the caffeine cravings of the Western world. 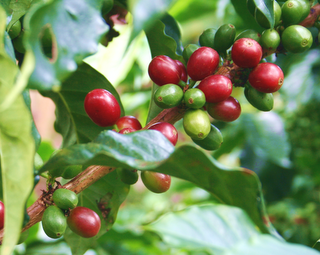 Coffea arabic a, or café in Spanish is an important crop in Nicaragua, especially in the north where it is a cornerstone of the economy, Ometepe though i s no slouch, producing its fair share, many tonnes which are organic. Bona Fide has some few dozens of producing plants, this year as part of our understorey planting strategy we have put in close to 150 plants of both Coffe a arabica and Coffea robusta. We plan on another 50-100 more in the coming weeks. We hope to produce enough to meet our consumption needs as well as our anticipated comsumption growth plus sell some value added BF coffee to help support our work here in the community. The lovely foto of a sea of red and yellow flags shows the tight plantings and shady area that is needed for a shade grown coffee environment, you do not need a lot of space for many coffee plants. The wonderfully shaped cone like flower bud with the ‘lily’ pads in the background is Nelumbo nucifera or Sacred Water Lotus, a key image in the Buddhist faith, also medicinal and edible, actually every part can be eaten. The root especially is favoured in many styles of Asian cooking. This blossom is our first and will produce a lot of seeds to continue our research into this promising crop for both food, medicine and the ornamental trade here in Nicaragua. The stone spiral you spy in the following foto shows the finishing touches going in on my new shower, sure to be an outdoor experience bar none. Kudos to David, Norman, Vienel and Martin for their attention to detail and craftmanship. This kind of stonework is a skill we are building to take advantage of the profusion of stone all obver the island to stimulate jobs and local economy here on island thru the development of skills and private business with social conscience. The final image is a gratuitous foto of my darling baby girl, Osa. Gets cuter everyday. Last but not least one bit. Farewell (for now) to Cat McGill, our dynamic garden co-manager and baker w/o peer. Cat will be back in 5-6 weeks after a tour of the US, weddings and visits. Buen Viaje! !